Disenchant Crafted Items adds a button and an information label to a profession window. When you craft an item that can be disenchanted it will show the number of those items in your bags and a "Disenchant" button will appear that will let you quickly disenchant all of those items without the need to target them in bags. It should be useful if you craft a lot of items with the intention of disenchanting them for materials. Works best with Enchant Vellum addon which will help you use all those materials you get. The button only disenchants items selected in the profession list, so no need to worry that it will disenchant something that it shouldn't. It ignores soulbound items (can be changed via slash command). The button will not try to disenchant already disenchanted item (that still exists in bag for a second after looting materials) so you avoid failed casts and annoying message "That item is not a valid target". Materials are autolooted after disenchanting (can be turned off via slash command). The button only appears when you have Enchanting and when selected crafted item can be disenchanted, and when there is at least 1 of that item in your bags. You can set key binding for the button to make it even easier to mass disenchant. The button appears on Guild Profession window as well so you can disenchant items crafted by profession you don't have. /dci or /disenchantcrafteditems - Help. /dci status - Information about current settings. /dci autoloot - Enable or disable autolooting of disenchanted materials. /dci soulbound - Include or exclude soulbound crafted items in disenchanting. I mail JC items to my Enchanter who is not a JC. I can open the guild-professions page for JC, but the 'disenchant' button does not appear. can you use it on items you dont create on that toon? 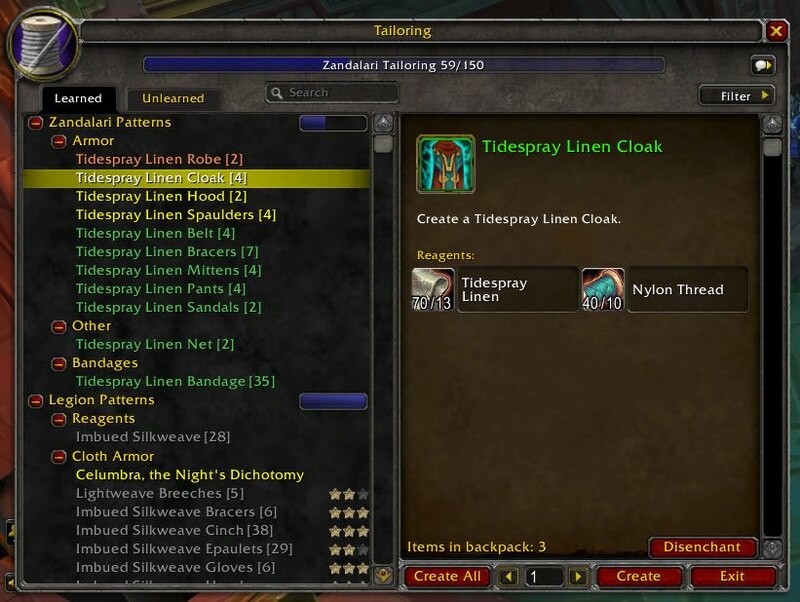 like lets say your tailor and enchanter arent on the same toon?